Download and play the demo now! Phew! It’s been a hectic few weeks, but now we have some time to breathe. So, you ask, what’s been happening? 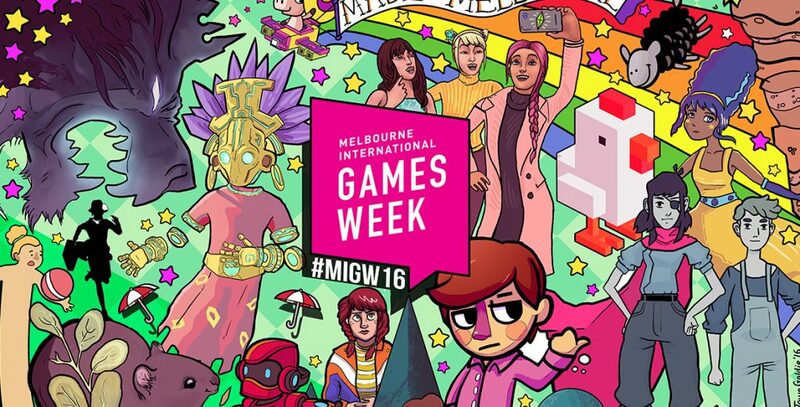 As has been thoroughly documented via Twitter, Tristian went to Melbourne Games Week – from GCAP to PAX, the WIG+ Lunch, and Megadev. It was a looong week, but as always it was well worth it. GCAP, or Game Connect Asia Pacific, is an industry event where professionals share talks and presentations about games. Sometimes these are informative, like Jennifer Scheurle’s presentation about how spatial design works in a VR environment like Earthlight, or entertaining, like Joshua Bradbury’s hilariously interactive talk about the value of animation in games. Often, they’re both! Luckily many of these talks eventually appear online, which is great because it’s often impossible to choose what thing to go and see next. Thursday saw the WIG+ Lunch, a social and networking opportunity for women and nonbinary people in games. This year it was run by Film Victoria, who asked Shannon Loftis and Jen MacLean to attend as guest speakers. As well as an opportunity to hear from giants in the industry and learn something new, the lunch also gives us a chance to catch up with people who might live in different states or countries, and to meet new colleagues and friends. And then came PAX, the enormous, sprawling, Penny Arcade Expo, which fills more or less all of the Convention Centre with games, people, cosplay, and ideas. As well as collecting handfuls of business cards and buying some new games from the PAX Indie Showcase area (including Aura of Worlds and the gorgeous Armed with Wings), Tristian also gave out a bunch of demo USBs to old friends and new. It was great to get lunch with Kevin Powe (voice of Garros) and finally meet Gemma Laurelle (voice of Jackin and the narrator) in person. As you might have seen in a recent Patreon update, we finally have a finished build of our demo available to play on PC and Android (and soon Mac). 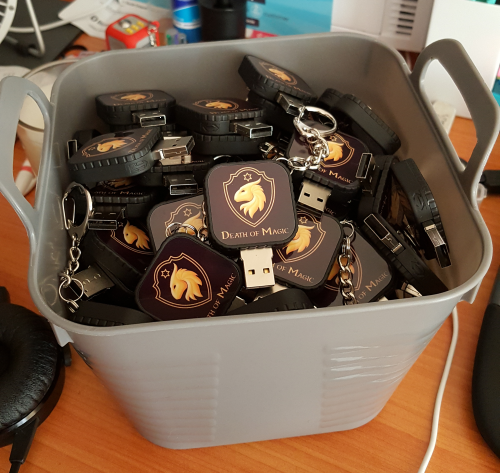 In the days before MIGW we put that demo, along with art, video, and other goodies, onto 100 custom USBs. If you caught up with Tristian while they were in Melbourne you might have snagged one of these for yourself already. If not, we’ll soon be opening a new donation tier on Patreon so we can send you one in the mail – worldwide! If you just want to play the demo, you can download it from our itch.io page. There’s a lot that’s gone into this game to get us to this point. From software, equipment, hiring external talent, and sheer time – none of this would have been possible without money. Back in 2013 both Tristian (artist and writer) and Lex (designer, programmer, and Certified Unity Wizard) began study at the Academy of Interactive Entertainment. AIE is a vocational college with campuses from Sydney to Seattle that teaches digital art for games and film, as well as programming and game design. Alumni have gone on to work at game and film studios like Rockstar, Weta, or Dreamworks. 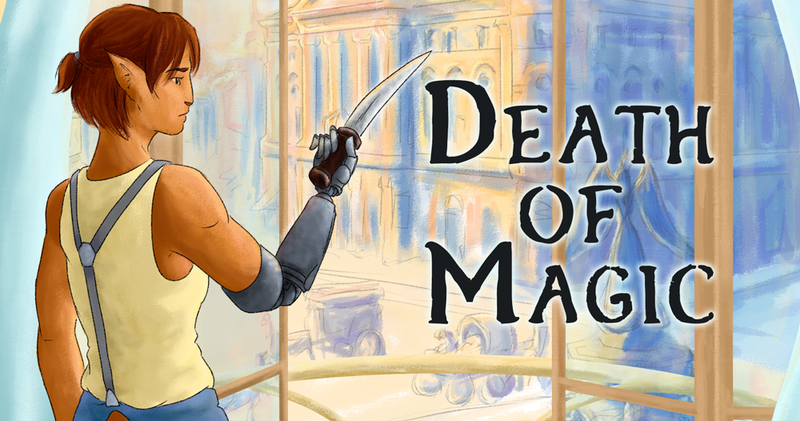 In 2016 we successfully applied for the AIE Incubator Project Grant, a program that provides financial support for alumni students to bring their prototypes to a commercial release, and were awarded funding to work on Death of Magic. It’s hard to overstate the impact this funding has had. While much of it has gone toward essential software or tools we needed to make our game, we’ve been able to stretch it much further than that. Here’s just some of the things we’ve been able to accomplish. And this isn’t even including what we’ve put toward Australian and indie games on Steam and Humble Bundle, the creators we back monthly on Patreon, or the individual artists and writers we’ve supported at conventions. The AIE grant has allowed us to take time to work on this project, to hire experts, and to pay them promptly at proper industry rates, but one of my favourite things is that we’ve been able to lend us our support to other developers. There are so many talented and hardworking game devs in Australia, and many of those people don’t have the resources they need. When someone asks, “Hi, can you buy this thing I made?” it’s been awesome to be able to say “Yes!” I am immensely grateful for that. It’s been a little while since GXAus in April, and those of you who met us then might be wondering what’s happening with the demo. We’d hoped to have it online shortly after the convention, but lining up the schedules of voice talent, direction, and sound/music people has taken longer than expected. We’re taking the opportunity to re-record some characters to ensure consistency across all voices, and are making sure the music is the best it can be. The second we’re able to, we’ll be putting the demo up on our website and itch.io so you can download and have a play for yourself (and show your friends!). We’ll be initially releasing for PC and Mac, with hopefully an Android build soon after. The 20-30 minute demo we showcased at GXAus constitutes only a small portion of our whole game. The whole story – where Jackin is thrust into deciding the future of the empire – takes place over the course of a week. The demo is just a snippet from Monday morning. We’ll be splitting the game up into six chapters for episodic release, with each chapter constituting roughly a day of game time, so our next milestone will be getting Chapter One into your hands. My favourite part of our game is the range of characters, and the fact that I’ve been able to create moving, breathing, emotive animations from 2D drawings is really exciting. The software that allows this, Live2D, has recently undergone a major update, so we’ll be updating our cast to the new format. Of course the software is also made in Japan and English documentation is tricky to find, so teaching myself how it all works can take time. 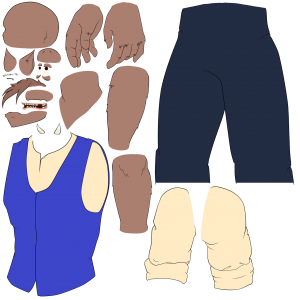 While it’ll take time to update our character rigs and animations to the new format, we’ll be able to do much better work with them down the line. A mentor of mine once said that in game development, while you can plan out the next few months, after that you’re just telling stories. As such, while we’d be super keen to be at Melbourne Games week again and to show off our demo at PAX, we can’t make promises on how far our funding will go. Our first priority is to pay our talent promptly and properly, and we’ll see what we can do for convention tickets afterwards. We’ve finally resurfaced after GX Australia. While it’s sad that it was the last one (for now?) we still had a lot of fun. It was fantastic to meet up with other game devs and even better to show off the demo to new people! Herbert is complaining about being the one to record observations of the subjects. He says it’s too depressing. I’ve reminded him that there aren’t many positions for people in our field, and certainly not any that pay so well, but he just glared at me and muttered that the money wasn’t quite worth it. I don’t see what his problem is. We’re at the forefront of what science can achieve. What we discover here can save thousands of lives. What’s a few rodents for all that? We really can’t wait to show off how they look when they’re moving! Work progresses in our next stretch to GXAus, with voice acting and background art in production. The main bulk of what has to be done before then is character sprites – someone has to tell this story, right? 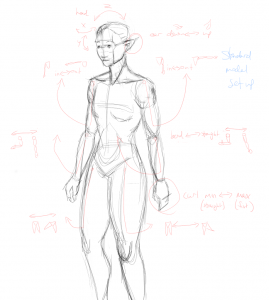 The various elements of the face can be complicated, but it’s far more interesting to deal with characters that have six limbs, or wings. 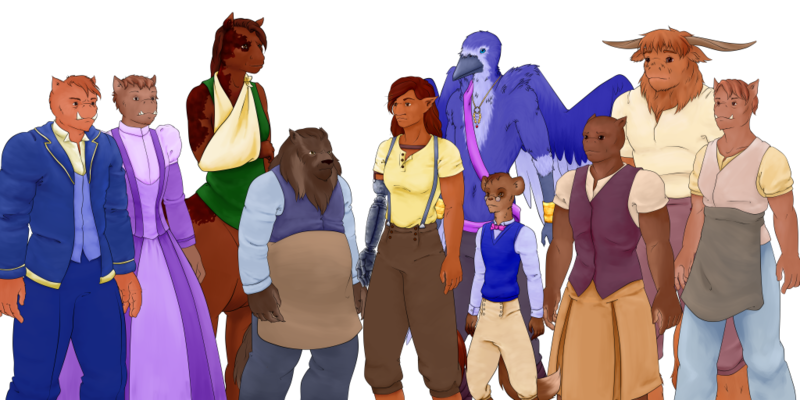 We’ll be updating our Patreon with some other examples of character sprites, as well as some new short fiction. To get an early peek at what we’re up to, drop by and donate a dollar or two. Melbourne International Games week is a collection of events that celebrate both members of the industry and games in general. There are opportunities for professional development as well as more commercial events that let developers interact with their audiences. While we’ve been to PAX Aus in years gone by, this year we focussed on Unite (showcasing games made with Unity as well as presentations and talks about potential uses of Unity) and GCAP (Game Connect Asia Pacific, which focuses on skills development and education for industry people). There was a huge amount to see and do at both conferences, and even splitting up to go to talks seperately there was only much we were able to see. Lex was impressed by a Unite talk by Maya Kerr and Ngoc Vu on how to create a hand drawn anime style using 3d models in Unity, as was done in Guilty Gear. My favourite presentation at GCAP was The Art of Making Thing Not Look Terrible, a summary of art principles as they pertain to game design, presented by Simon Boxer and Jacob Janerka. All industry talks are better with party poppers. Another important talk, while not exactly an enjoyable one, was Mental Health for Game Development by Jennifer Hazel of Checkpoint. There’s a pervasive culture in game dev that if you’re not working until you drop, you’re not really working hard enough. The documentary Indie Game gives you a glimpse of what effect this has on developers. The physical and mental impact of burnout is huge, and particularly important to deal with for developers working alone. In addition to professional development, GCAP and Unite also host a number of networking events for attendees. Being based in Sydney, away from the main hub of Australian game talent in Melbourne, this was a chance for us to meet and mingle with a new crowd of people. We were able to finally meet face to face with both our composer, Tamara Violet Partridge, and our voice talent director Kevin Powe. I was also lucky enough to be invited to the Women in Games Lunch hosted by Film Victoria. This event both celebrates women working in games, and allows us a chance to network with colleagues and catch up with friends. This year’s guest speaker was Kim McAuliffe, a game designer from Seattle who’s worked on everything from shooters to The Sims series. Hearing the range of work she’s done on different types of games and in different roles was hugely inspiring. After taking some time to recover from MIGW (and GX Santa Clara before that) our next goal is GX Aus in April next year. 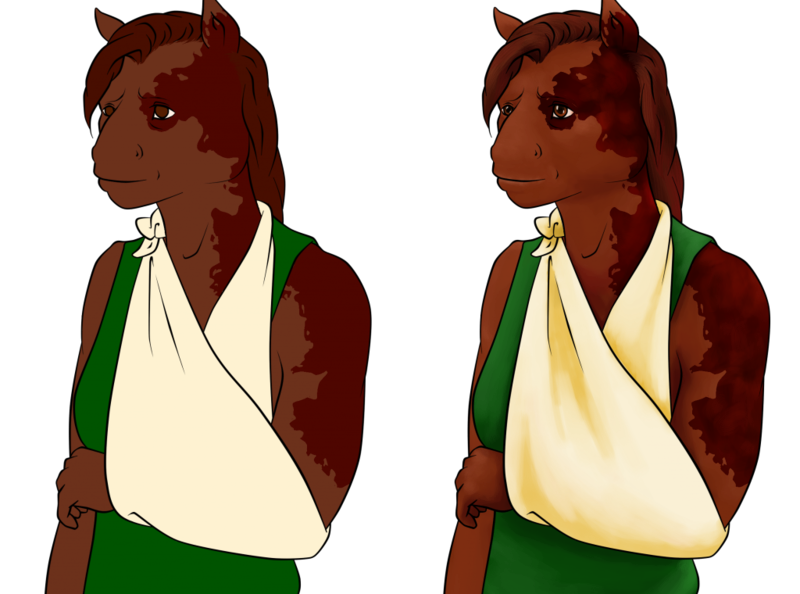 In the meantime, we’ll be updating our Patreon monthly with new art and fiction, and with progress updates as they happen. Yes, that’s right, we have a Patreon! Feel free to share it around. Even if you aren’t able to support financially, getting the word out is a huge help. Dan and Cixi stepped through the inner door, and into a world of gold. It was all around them, stretching overhead to form a sky of yellow and orange flowers growing on vines that spiralled into the mesh walls. High above shafts of sunlight managed to make it through the thick layer of flowers, shining off their petals in glittering shades that looked like the sparkle of precious metals or gems. No flowers should shine so bright, and indeed none would have, were it not for the creatures tending to them. Bronze shapes punctuated the yellow, shaped a little like birds but with dark wings which made a leathery sound as they flapped from one wall to another around the giant enclosure. Fae, the entire reason for the existence of this place, and for the pair’s visit. 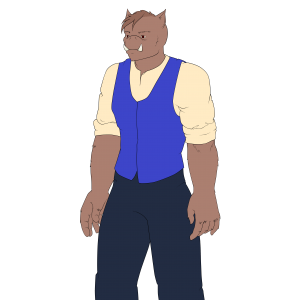 Dan looked down at Cixi and the neatly suited goblin looked back up, dark eyes and lightly furred face holding a certain nervous excitement. Cixi’s paws formed a pattern, signing the question: Ready?